A short drive from Kettering, Fairborn, East Dayton, Xenia, Wright Patterson Air Force Base! 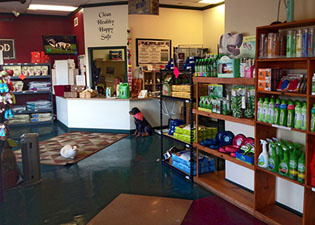 If you have never visited our establishment you and your pet are in for a special treat! Wtih 88 combined years of experience, GroomingDales Pet Salon and Day Spa is still pleasing the discriminating pet owner in southwest Ohio after 21years! The only pet salon in the tri-state to implement team trimming with the specific goal of providing the community with a safe, clean, healthy and happy environment to have pets groomed. We take pride in having the pets we groom and style return time and time again, bright-eyed and tails wagging! owner and see our salon! and what we are all about! Let us pamper your pet. Call today for a price quote on professional grooming for your dog or cat! We do avian and exotic pet grooming too!